Greetings everyone! Rich Viso here reporting from the R/V Atlantis. Rick Peterson and I continue to have a great experience. 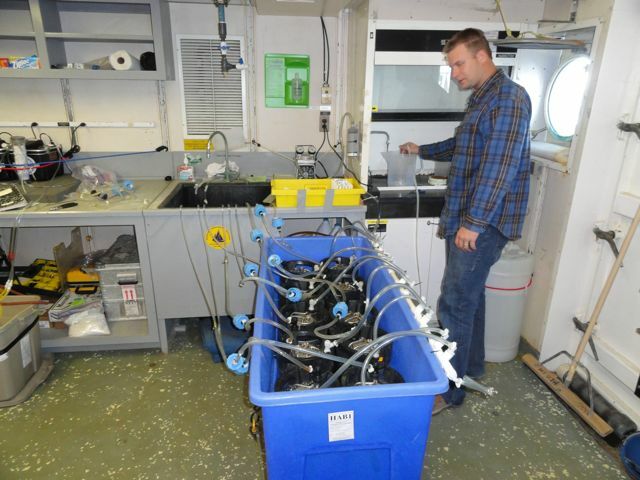 We are set up to measure radium and radon in the wet lab located on the aft portion of the starboard side of the ship. There are double doors with windows at the aft end of our lab and the manned submersible Alvin is right on the other side of the doors, no more than five feet away. Yesterday (11/8) we continued doing some background and calibration measurements on our equipment. After lunch, we had a science meeting followed by a fire and boat safety drill. During the science meeting we learned about executing our jobs on the ship as well as the science objectives. 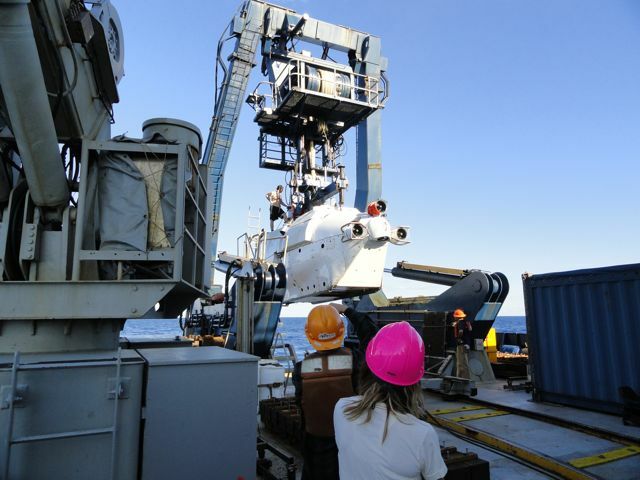 The plans are ambitious and include a wide range of scientific interests to learn about the deep brine environments, life in such environments, and impacts on the Gulf of Mexico from the oil spill. Today (11/9) Rick and I performed the first CTD/Niskin cast of the cruise. We recovered 23 bottles of water from a variety of depths between 2300 m and the surface. The entire cast took about 3 hours and we began at 3 am. Once the rosette containing the Niskin bottles was back on deck, the science party began collecting our respective samples from the bottles. Some scientists are waiting for sediment samples and tonight’s plan is to perform another rosette cast and to cast a multicorer that will bring back sediment samples from the bottom. The first Alvin dive of the cruise also took place today. The entire process was quite interesting to watch and it cranked up the excitement aboard the ship another notch. Today’s dive was an engineering dive, which involves training for a new sub pilot. The divers consisted of a pilot, the pilot in training, and the chief scientist (Mandy Joye, UGA). The dive was successful down to a brine pool location and 6 brine samples were recovered along a vertical transect from just above the pool to well into the pool. While the dive occurred, Rick and I measured radon and radium in the samples from the Niskin bottles all day long.We are set to receive brine samples and will try to measure radon in the gas that was collected with the brine fluid.